You are devastated, the world seems to close in around you, and you start asking yourself a myriad of personal questions – “Was it the artwork they didn’t like,” or “Perhaps my work experience was not appropriate,” or “Were my colors off” . . . and then you end up thinking, “My art is terrible,” or even worse, “Nobody likes me!” So what do you do – tuck your tail between your legs and go hide in a corner, thinking the world hates you and your artwork? Nothing could be further from the truth. What does it mean when someone says “No, Thank you! ?” Quite simply, the way to look at this is that “No, Thank you!” simply means “No, not right now!” Unless what you have submitted is diametrically opposed to the culture of the manufacturer and product you are seeking (ie., gut splitting art of body functions sent to a highly inspirational and religious manufacturer), what you are hearing is that at that moment of review, your submitted art is not right for them. The world is an ever-evolving place, and things change daily – directions change, trends change, people change, retailers are looking for something different, etc. 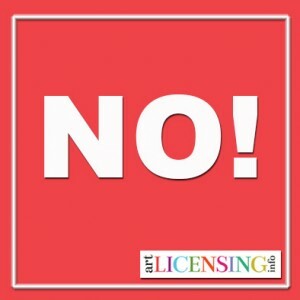 So what you have submitted for consideration of licensing, which may not have been appropriate at the moment of submittal, may meet a need tomorrow, or a week/month/year from now. Don’t give up! Set up a “Reminder” file to yourself to resubmit your art or inquire of the company to whom you have submitted to about a month after the initial presentation, or anytime you know there has been a personnel change in the company. Test the waters again, and ask if your artwork will meet a need in their line. You basically have a 50/50 chance of either hearing, “Well yes, can you send us a hi res file!”, or you may hear “No, Thank You!” once again. If you get the dreaded “No” answer, inquire as to what about your artwork was not working for them, and what you can offer to meet their needs. Keep an open and positive flow of communication ongoing. So whenever, you hear here a “No, Thank You!”, just remember, you are hearing “No, not right now!” Don’t get discouraged! !